December 14, 2016 December 14, 2016 • Glenna G.
This year my birthday was on Thanksgiving. I was thankful to get a small feast, a visit from my family, and PIE! My parents flew down from Iowa for the long weekend. 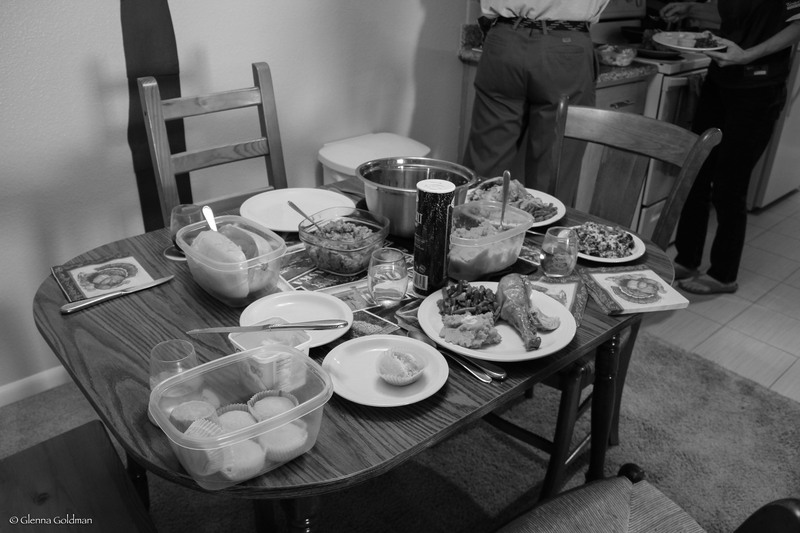 Jake and I made a ton of delicious food, and I must say, everything turned out quite well. The rest of the day was spent exploring the neighborhood, and eating. Because, Thanksgiving. If you’re ever in central Scottsdale and in need of a walk/barbecue/bocce ball throwdown, I highly recommend Chaparral Park. 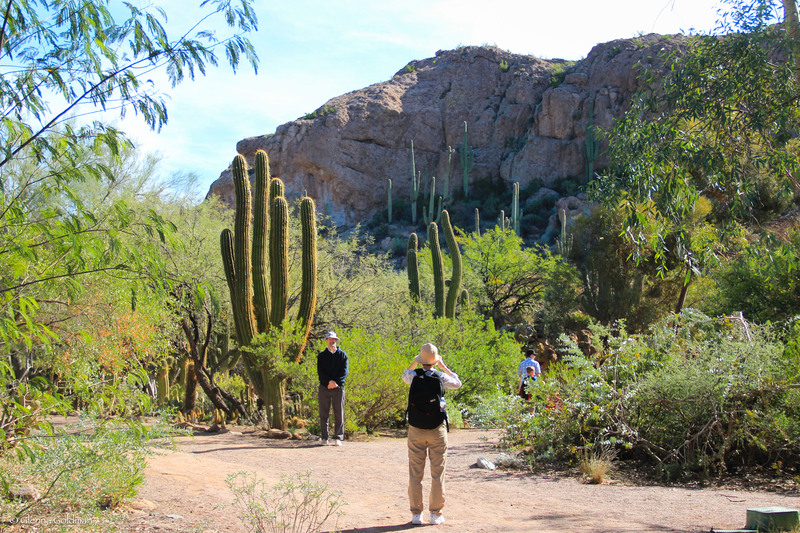 Jake and I had been given some complimentary Arizona State Park passes at a tourism event, so we decided to take my parents to Boyce Thompson Arboretum State Park. It’s about an hour from Phoenix, making it a good day trip. 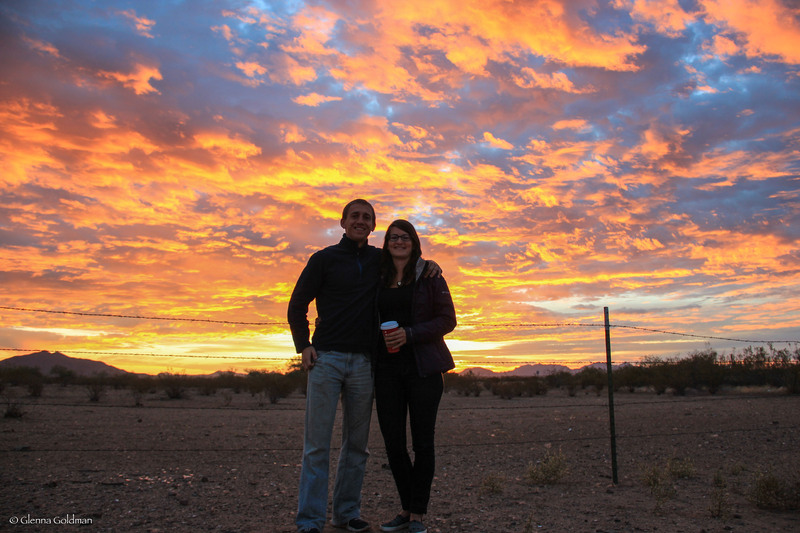 Founded in 1920 by Boyce Thompson (a mining magnate), the park encompasses over 320 acres of preserved desert life. The area has transitioned from Arizona’s first non-profit research institution in the late 1920’s to a state park in 1976. We walked a loop around the park, passing many cactus gardens, greenhouses, a small lake, Boyce Thompson’s mansion, and even an herb garden. We stumbled upon a small craft market and some delicious posole (a Mexican soup made from hominy and pork) within the park’s main area. We particularly enjoyed a garden containing medicinal plants, with signs about how they were used by native tribes. After completing the loop, we had a lunch of Turkey Day leftovers and browsed the gift shop before heading back to Phoenix. In the center of Phoenix, a few blocks from Sky Harbor Airport, is a small museum on a very important archaeological site. The Pueblo Grande Museum illustrates life in the desert before the arrival of European explorers. The Hohokam lived here for about 1,000 years. This particular site supported 1,000-2,500 people who grew cotton, corn, beans, and squash with the help of canal irrigation. Few people who live in Phoenix realize that some of the canals we see today have existed for much longer than the city itself. A short trail circles the remains of a Hohokam ballcourt and platform mound, replicated dwellings, and an interpretive garden with native plants. The indoor portion of the museum displays Hohokam artifacts and culture, and more information about the wide network of hand-carved canals. The Hohokam also survived by hunting small game, and fishing in the rivers and canals. They traded cotton with nearby communities, made jewelry from shells and semi-precious stones, and created distinctive pottery. This museum is a hidden gem, and although it is small, it’s well worth a visit. The following day, we breezed through the Old Town Farmers Market and an art festival in Civic Center Park, and headed to Chompie’s for lunch. This New York style deli has quite a history in Phoenix. I discovered it last time I lived in AZ, and it’s never disappointed. My dad was impressed with all of the menu items he hadn’t seen since he left NYC. If you’re in doubt (you will be, the menu is huge! ), I highly recommend the Holland Tunnel. We also visited the Musical Instrument Museum in North Scottsdale. One of the most diverse collections of musical instruments and recordings in the world, it’s definitely worth a visit for music-lovers. We were each given a headset and receiver, and as we walked up to an exhibit with a TV screen, the audio began playing. My favorite parts were the display of unique guitars, an entire room where you get to try out a bunch of different instruments, and the piano in the foyer (quite a few people played while we were watching). I hope to check out a concert or two, in the museum’s performance hall. My parents had to depart the next day. Still so much to see and do, but I was happy to show them around in the Arizona sunshine for a few days. Jake and I had been wanting to do this for quite a while. It was a fascinating morning, as we watched the entire process from start to finish. We were a bit nervous, as the weather forecast hinted at rain later in the day. We met before dawn in a Safeway parking lot, and hopped into a van with a few other people. 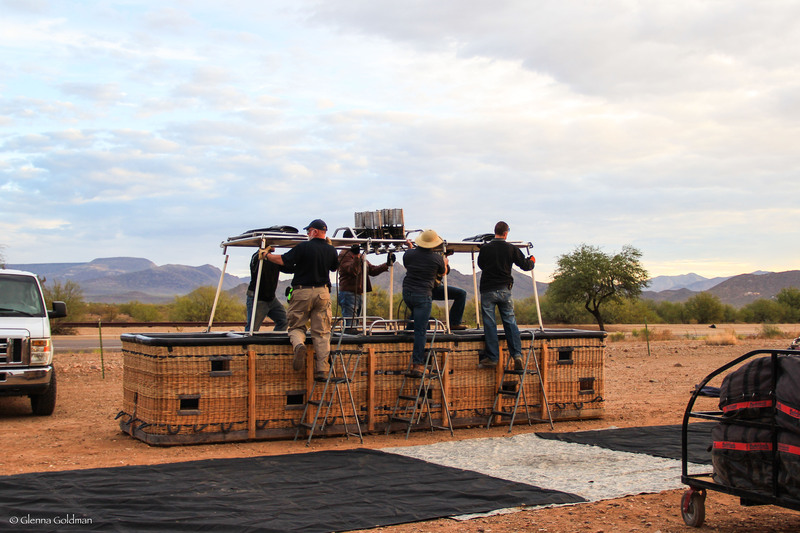 We were driven to a few test launching sites, where the crew watched a small balloon spiral up into the sky and determined whether the wind conditions were good enough to launch the big balloon. The clouds gave us a great sunrise to admire while we waited. 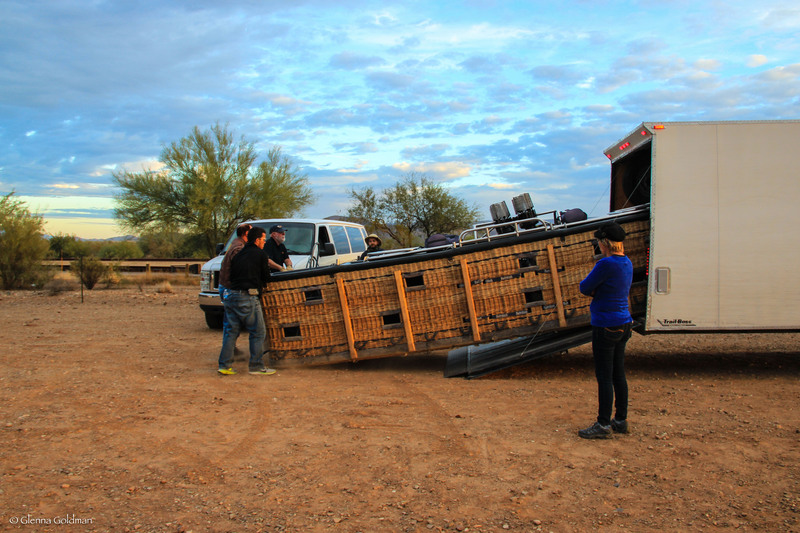 When we finally had a “Go!”, the crew unloaded the basket from the truck. It was quite a bit bigger than we’d expected! First the guys pulled out some stepladders and assembled the top. 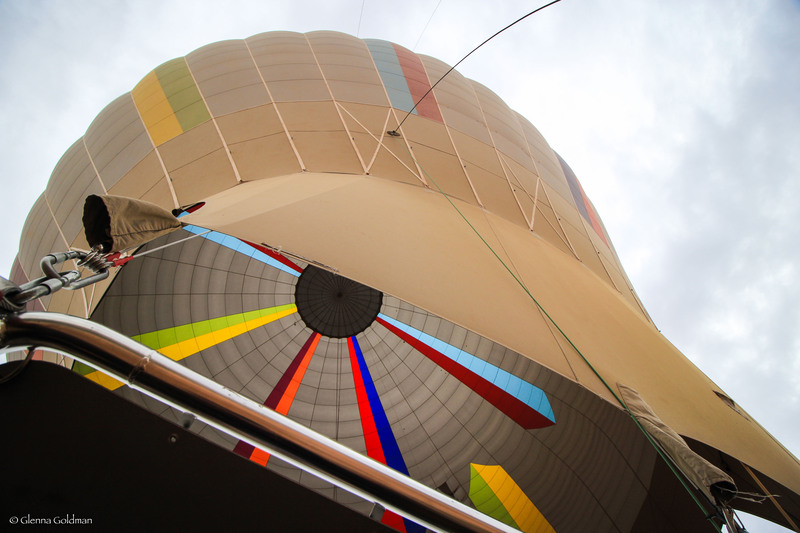 Then they rolled out the canvas, and blew air inside to fill up the balloon. After the balloon was suitably full of air, they blasted hot air inside to get the basket upright. We hopped in, using the loops built into the basket as steps and handles. 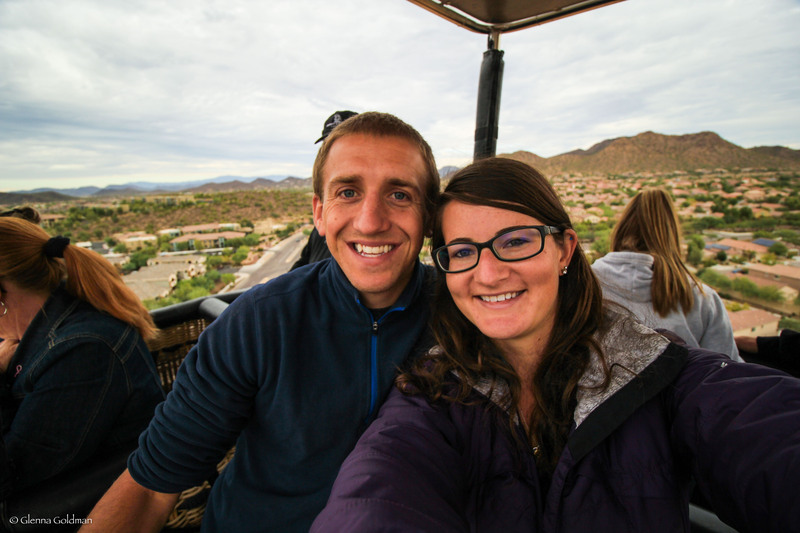 We soared over the desert, and a few housing developments. Everything looked like a train set from a few thousand feet above. My favorite part was the barking dogs, trying to chase us from their fenced-in yards, and teenagers taking pictures of us from below. When we reached the landing place, the captain told us to hang on and let our knees bend to absorb the impact. After a few bounces, the basket finally settled into a field. The crew pulled on a few ropes, causing the balloon to collapse into itself and puddle down to the ground. We watched as they rolled it back up into its tidy bundle. 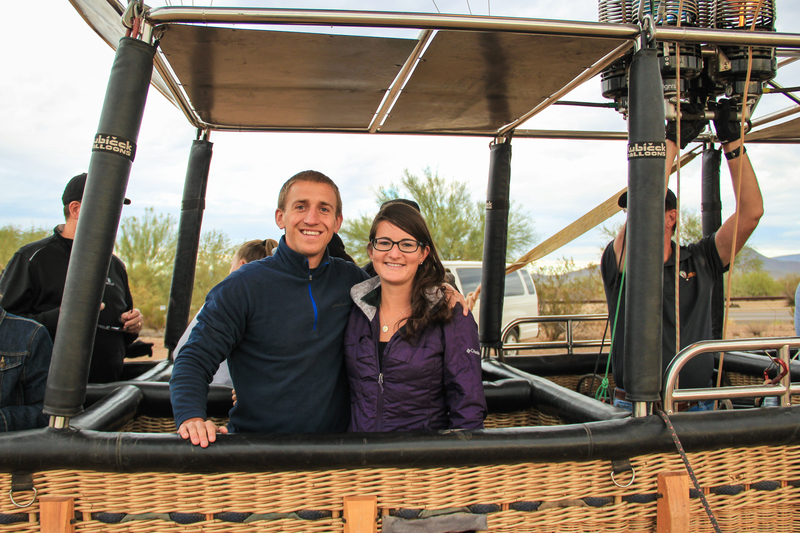 I’d highly recommend Arizona Balloon Safaris if you’re looking for a fun adventure! Thanks for the awesome birthday gift, Jake! Posted in Outdoors, Travel BlogTagged Nature, People, Travel BlogBookmark the permalink. I was impressed with everything in this post, especially the hot air balloon.. until it came to the part where he used the sword to cut open the Champagne!! That is so amazing!! Sounds like you had a much better trip than the balloon ride birthday present we bought my mom many years ago—it went off course and crash landed in the Tonto National Forest north of the valley. They had to hike out several miles, but luckily, no major injuries. Oh my gosh! That’s scary… I’m glad you told me that AFTER I went. OHMYGOSH!!! This looks amazing!!!! I love your blog!!! !